A quick and easy explanation of how we turn a simple glass of water into a pint of smooth, balanced, golden ale. Beer is made by a simple and natural process. Yeast converts sugar and water into alcohol and CO2 (google “fermentation reaction“). First we convert the starches from grains into sugar with warm water and end up with sugary water. Then we add flavor, and then we add yeast. We wait patiently while yeast converts the sugars in the water to alcohol, then we carbonate it and have beer. We start with grains (usually barley, there are many types, prepared in many different ways for many different flavors – munich malt, golden pils, etc. ), put them in warm water (170˚ F) for a while, and let enzymes naturally convert the starches in the grains to sugars (this is called MASHING). At this point it looks like a bucket of oatmeal. Next we strain the oatmeal, rinse it with clean water to get all the sugar out (this is called SPARGING) and we put the sugary water (called WORT) in a pot on the stove and bring it to a boil. 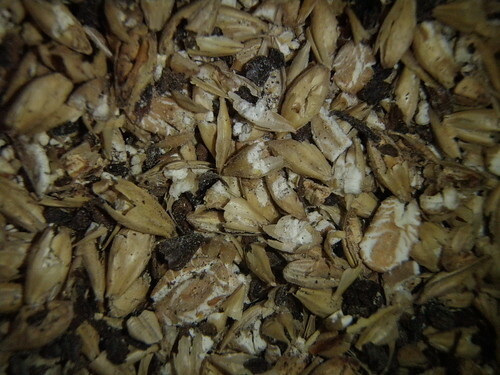 Much of the flavor of beer comes from the different types of grains used; adding hops adds bitterness and aroma. There are many different varieties of hops, with many different flavors. Depending when you add the hops during the boil (the boil usually lasts an hour or so), you will get different results. For example, hops added at the beginning of the boil contribute towards bitterness; hops added at the end of the boil generally add aroma. After the boil, we cool the wort (sugary water) and add active live yeast. Put the liquid in a vessel to allow the yeast to ferment the sugars. For homebrewing, we usually use a 6-gallon glass container known as a carboy. The carboy has a one way valve on it that allows CO2 to be released (so it doesn’t explode) but doesn’t allow wild yeast and other microorganisms to get into the beer (this would spoil it or at least add off-flavors). We leave the carboy wrapped in a blanket (this blocks the light and helps to maintain the correct temperature) in the basement for about 2 weeks, until all the sugar is converted to alcohol. At this point, we have fully ready beer, except it is flat. There are two ways to add carbonation. First is put it in a keg, attach a CO2 tank, and force carbonate it. The second way is more natural, which is by doing a secondary fermentation (usually in bottles). [NB: Champagne is carbonated the same way]. We take a little corn sugar, dissolve it in warm water, and add it to the beer. Then we put the beer in sterilized bottles and put caps on. We wait another two weeks or so for the yeast to ferment this new sugar, but this time the CO2 is not allowed to escape, and it carbonates the beer. This secondary fermentation is also known as CONDITIONING. After two weeks, crack open the beers and drink them with friends. Feel free to ask anything about this process in the comments below.